Kayaking is like canoeing, only better. They were originally invented by the Inuit in Alaska and used for hunting (the word means “hunter’s boat”). The defining characteristic of a kayak is the way the boater sits centrally in a long, thin boat and gets along using a paddle. Today they are used for sport. Kayaks are made differently to handle different boating environments, such as calm seas and whitewater. There are also special racing kayaks, designed for speed. Sea kayaks are long, stable boats with steering mechanisms that can keep a straight path through the water. They are larger and more dependable than other kayaks, but this comes at the cost of manoeuvrability. They are also often big enough to hold more than one kayaker, unlike whitewater kayaks. 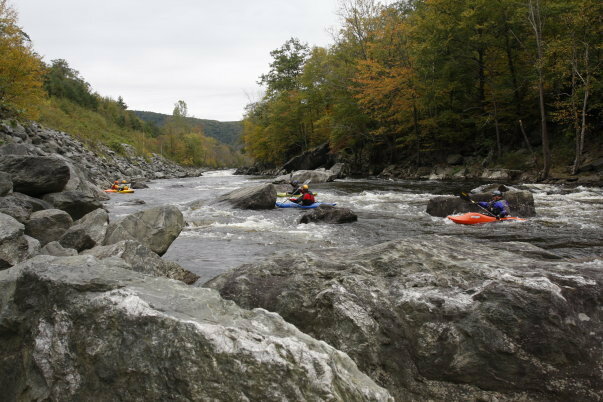 Whitewater kayaks are smaller, sportier boats. They are very easy to steer precisely and quickly, but they are not very fast. What speed they do have comes from the way they are designed to harness the energy of fast-flowing rivers. If you go on a kayaking trip, the chances are that this is the kind of kayak you will be riding in. Racing kayaks, on the other hand, are neither slow nor stable. They are expensive, lightweight boats, built for speed and nothing else, and barely even wide enough to hold a person. 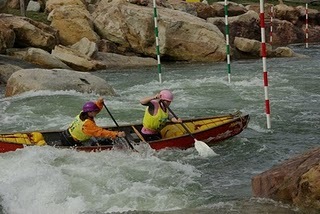 It is these kind of kayaks that you will see in the Olympics and other kayaking competitons, as what they lack can be made up for by highly-skilled boaters. When considering kayaks, a general rule is that the longer the kayak is, the faster yet less manoeuvrable it will be, and vice versa. However, this is not the only factor, as the overall shape of the kayak will also have some effect. There are also some unusual kinds of kayaks. The inflatable kayak, for example, is often used by casual hobbyists, as it can be transported so easily. They used to be only suitable for calm waters, but design advances have made them suitable for some reasonably fast-flowing environments such as the sea.